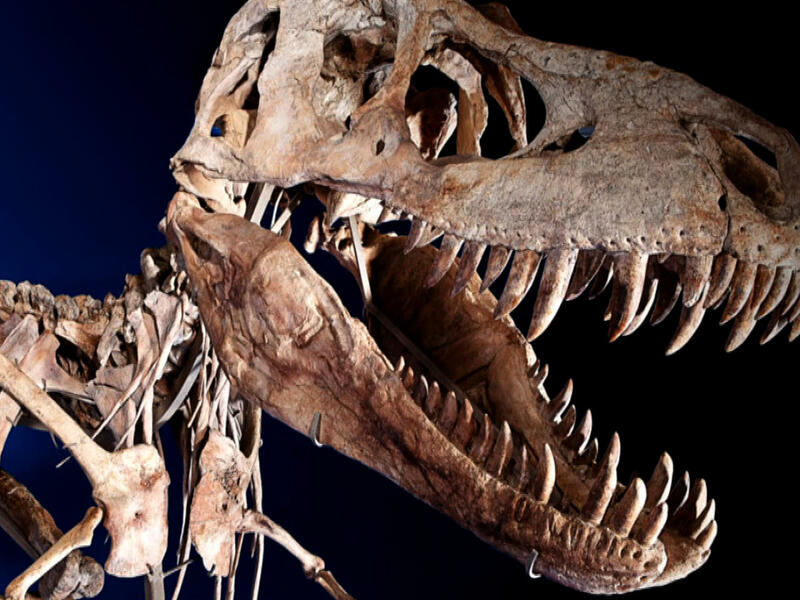 Dinosaurs may not have been cold-blooded like modern reptiles or warm-blooded like mammals and birds -- instead, they may have dominated the planet for 135 million years with blood that ran neither hot nor cold, but was a kind of in-between that's rare nowadays, researchers say. Modern reptiles such as lizards, snakes and turtles are cold-blooded or ectothermic, meaning their body temperatures depend on their environments. Birds and mammals, on the other hand, are warm-blooded, meaning they control their own body temperatures, attempting to keep them at a safe constant -- in the case of humans, at about 98.6 degrees Fahrenheit (37 degrees Celsius). To help solve this decades-old mystery, researchers developed a new method for analyzing the metabolism of extinct animals. They found "dinosaurs do not fit comfortably into either the cold-blooded or warm-blooded camp -- they genuinely explored a middle way," said lead study author John Grady, a theoretical ecologist at the University of New Mexico. Scientists often seek to deduce the metabolisms of extinct animals by looking at the rates at which their bones grow. The method resembles cutting into a tree and looking at the thickness of the rings of wood within, which can reveal how well or poorly that tree grew any given year. Similarly, looking at the way bone is deposited in layers in fossils reveals how quickly or slowly that animal might have grown. Grady and his colleagues not only looked at growth rings in fossils, but also sought to estimate their metabolic rates by looking at changes in body size as animals grew from birth to adults. The researchers looked at a broad spectrum of animals encompassing both extinct and living species, including cold- and warm-blooded creatures, as well as dinosaurs. The scientists found growth rate to be a good indicator of metabolic rates in living animals, ranging from sharks to birds. In general, warm-blooded mammals that grow about 10 times faster than cold-blooded reptiles also metabolize about 10 times faster. When the researchers examined how fast dinosaurs grew, they found that the animals resembled neither mammals nor modern reptiles, and were neither ectotherms nor endotherms. Instead, dinosaurs occupied a middle ground, making them so-called "mesotherms." "For instance, tuna body temperature declines when they dive into deep, colder waters, but it always stays above the surrounding water," Grady told Live Science. Body size may play a role in mesothermy, because larger animals can conserve heat more easily. "For instance, leatherback sea turtles are mesotherms, but smaller green sea turtles are not," Grady said. However, mesothermy does not depend just on large size. "Mako sharks are mesotherms, but whale sharks are regular ectotherms," Grady said. Endotherms can boost their metabolisms to warm up -- "for instance, we shiver when cold, which generates heat," Grady said. "Mesotherms have adaptations to conserve heat, but they do not burn fat or shiver to warm up. Unlike us, they don't boost their metabolic rate to stay warm." Some animals are what are known as gigantotherms, meaning they are just so massive that they maintain heat even though they do not actively control their body temperature. "Gigantotherms like crocodiles rely on basking to heat up, so they are not mesotherms," Grady said. "Gigantotherms are slower to heat up and cool down, but if they rely on external heat sources like the sun, then they are not mesotherms. In general, mesotherms produce more heat than gigantotherms and have different mechanisms for conserving it." Mesothermy would have permitted dinosaurs to move, grow and reproduce faster than their cold-blooded reptilian relatives, making the dinosaurs more dangerous predators and more elusive prey. This may explain why dinosaurs dominated the world until their extinction about 65 million years ago, Grady suggested. At the same time, dinosaurs' lower metabolic rates compared to mammals allowed them to get by on less food. This may have permitted the enormous bulk that many dinosaur species attained. "For instance, it is doubtful that a lion the size of T. rex would be able to eat enough wildebeests or elephants without starving to death," Grady said. "With their lower food demands, however, a real T. rex was able to get by just fine." All in all, Grady suspected that where direct competition occurs, warm-blooded endotherms suppress mesotherms, mesotherms suppress active but cold-blooded ectotherms, and active ectotherms suppress more lethergic sit-and-wait ectotherms. Although mesothermy appears widespread among dinosaurs, not every dinosaur was necessarily a mesotherm, Grady said. "Dinosaurs were a big and diverse bunch, and some may have been endotherms or ectotherms," he said. "In particular, feathered dinosaurs are a bit of a mystery. What do you call a metabolically intermediate animal covered in feathers? Is it like the mesothermic echidna? Or just a low-power endotherm?" The first bird, Archaeopteryx, "was more like a regular dinosaur than any living bird," Grady said. "It grew to maturity in about two years. In contrast, a similarly sized hawk grows in about six weeks, almost 20 times faster. Despite feathers and the ability to take flight, the first birds were not the active, hot-blooded fliers their descendants came to be." These findings could help shed light on how warm-blooded animals such as humans evolved. "The origins of endothermy in mammals and birds are unclear," Grady said. Studying the growth rates of the ancestors of birds and mammals "will shed light on these mysterious creatures." The scientists detailed their findings in the June 13 issue of the journal Science.